Dental implants are surgically placed for a secured solution to replacing a tooth. As our patient at Maria Kim, DMD, we do everything we can to create a preventive treatment plan that helps you stay healthy, avoid tooth loss, and maintain a beautiful smile. Unfortunately, tooth loss is occasionally unavoidable. Deep decay, trauma, infection, fractures, and misalignment could require an extraction to protect the health of your remaining teeth. Maria Kim, DMD, understands that facing tooth loss can affect how you feel about your appearance as well as creating challenges when it comes to eating and speaking properly. We will help you make the best decision for your health and appearance. We offer dental implants as a potential tooth replacement option. Most dentists agree this is the solution that most closely mimics your natural teeth. 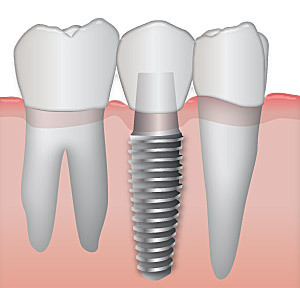 Dental implants consist of a custom dental crown supported by a titanium screw. Titanium works with your body and naturally integrates with your bone to supply a stable foundation for your crown. We create each crown individually to match your natural teeth and smile. After dental implant surgery, we will allow time for your body to heal, often several months. Once healing is complete, we will place your dental crown and make any final adjustments to ensure a comfortable bite. Tooth preservation: bridge vs. implant - Dental implants eliminate the need to alter healthy teeth to create a dental bridge. By opting for a dental implant, you replace teeth without altering the function and integrity of your healthy remaining teeth. Bone preservation – Your teeth and bone have a dependent relationship. Roots stimulate bone regeneration, and your jawbone supports the roots of your teeth. When you lose teeth, this relationship is jeopardized. Bone loss, also called resorption, can cause additional tooth loss and changes to your facial structure. Bite preservation – Your bite, also known as occlusion, changes as the geography of your mouth changes. When you lose a tooth, your remaining teeth may shift toward the gap and create occlusal problems. Your dental implant will act as a space holder, keeping your bite stable. Oral hygiene – Because we surgically place your dental implant, it will stand alone, making it easier to keep clean with regular brushing and flossing than it is to keep a fixed bridge clean. Many patients express concerns about pain during implant placement. Dr. Kim will ensure your comfort and proceed only when the area is properly anesthetized. If you feel anxiety during your treatment, our compassionate team will put you at ease. For those patients with a significant fear of dentistry, sedation dentistry can help you have a positive, relaxing experience for your dental procedures. Most patients report little or no pain and appreciate our dentist’s gentle touch, attention to detail, and kind nature. After your treatment, we will discuss how to best care for your mouth while it heals after an implant procedure. Certain behaviors like smoking and drinking through a straw can cause a painful dry socket. Keeping the area clean and free of food particles will help you heal faster and avoid irritation. Bleeding: Slight bleeding after surgery is not unusual. Your saliva may be tinged with blood for up to 24 hours. Gauze should be left in place over the surgery site for at least 2 hours maintaining firm biting pressure. Note: Sinus bone graft patients may experience bleeding through the nose for up to 24 hours after surgery. A gauze pack will be placed over the site after surgery. Do not forcefully spit or irritate the surgery site. This may cause further bleeding. If bleeding persists, it may be controlled with pressure. Moisten a clean gauze and place directly over the extraction site. Apply moderate biting pressure for approximately half an hour. Repeat if necessary. Pain: It is not uncommon to have discomfort and pain for the first few days after surgery. Take pain medications as needed. The first day it is recommended to take medication even with minimal pain as it is easier to prevent pain than decrease it. Pain medications are most effective when taken before local anesthesia diminishes and normal sensation returns. Do not take pain pills on an empty stomach. Narcotic pain medication such as codeine, oxycodone, or hydrocodone may cause nausea, vomiting, drowsiness, dizziness, itching or constipation. If these side effects occur, discontinue the medication. You may take an alternative over the counter pain medication as necessary or call our office for assistance. Note: Narcotics (Vicodin) can be supplemented with Ibuprofen (~600 mg) or extra strength Tylenol (500 mg) if added pain relief is needed. Swelling: After surgery, swelling around the mouth, cheeks, eyes and side of face is very common. This is the body's normal reaction to surgery and eventual repair. Swelling usually will not become apparent until the day following surgery and will not reach its maximum until 2-3 days post-operatively. However, the swelling may be minimized by the immediate use of ice packs. Apply an ice pack to the outside of your face over the surgery site for 20 minutes on, 20 minutes off for the first 24 hours. Prepare several cold packs by putting damp washcloths in small zip lock freezer bags. These should be placed in your freezer for use following surgery. Poly-vinyl bags of frozen peas also work well. After 24 hours, moist heat can be applied to the area as ice will increase swelling. Sleeping with your head elevated above the level of the heart for the first two post-operative nights tends to lessen swelling. Bruising: Bruising is also very common after surgery. Bruising can be present over the surgery site and to the lower chin area (possibly the neck area). The development of black, blue, green or yellow discoloration is due to blood spreading beneath the tissues. This is a normal post-operative occurrence, which may occur 2-3 days post-operatively and last up to 14 days. Moist heat applied to the area may speed up the removal of the discoloration. Nausea: Nausea may result from anesthesia medications or the drugs prescribed for pain. To minimize this possibility, avoid taking any medications on an empty stomach. Take all medications with a small amount of food. If you feel nauseated or sick to your stomach drink clear liquids such as Ginger Ale, 7UP, apple juice, broth or try eating toast and crackers. Diet: After surgery, drink lots of clear liquids and eat soft nutritious foods. Do not drink alcohol or hot liquids. Be cautious until the anesthesia wears off as you have no feeling in the surrounding area and you may unknowingly injure yourself. Avoid acidic foods such as tomatoes, orange juice, and citrus fruits until the surgery site has healed (2 weeks). Do not drink through a straw for at least 48 hours. If you had surgery on only one side of your mouth, favor the other side while chewing for the first few days. Oral Hygiene: Hygiene should not be neglected as an accumulation of food and debris may promote inflammation and/or infection. You may rinse and brush your teeth starting the day after surgery. Brush your teeth as usual and rinse with warm salt water (1/2 teaspoon of salt in 12 oz. of water) after each meal beginning gently the night of surgery. Do not brush the surgical area for 4-5 days. The chlorhexidine mouthrinse can also be started the following day after surgery. Activity: Limit strenuous activity for the first 2-3 days. This will reduce bleeding and minimize swelling. Strenuous work or exercise may promote bleeding. Fever: After surgery it is normal for the body temperature to be slightly elevated for 24 hours. Please remember to drink sufficient amounts of clear liquids to keep your body hydrated. Please contact the office if there exists a high temperature or if a low-grade temperature persists after the first 24 hours. Smoking/Alcohol: Smoking and alcohol delay healing and predisposes you to infection which can result in the failure of the implant or bone graft. Do not smoke or use alcohol until the incision line is completely healed (> 2 weeks). Sutures: Sutures are placed in the area of surgery to minimize post-operative bleeding and to help healing. Sometimes they become dislodged, this is no cause for alarm. Just remove the suture from your mouth and discard it. The sutures will be dissolved and should dissolve on their own in approximately 3-10 days. If they are still present, our office will remove them on your post-op appointment. Medication: It is very important that you take all your prescribed medications from our office as prescribed. Each medication has a specific role in the post-operative period of your surgery. Discontinue the antibiotic medication if a rash develops or if an upset stomach persists. Report this immediately to our office. Women please note: If you are currently taking Birth Control Pills, be aware that taking antibiotics will decrease the effectiveness of the Birth Control Pills and alternative methods should be utilized. NEVER DISCONTINUE OR MODIFY ANY MEDICATION YOUR PHYSICIAN HAS PRESCRIBED FOR YOU UNLESS INSTRUCTED BY YOUR PHYSICIAN. Wearing Your Prosthesis: Partial dentures, flippers or full dentures should not be used immediately after surgery until your post-operative appointment, unless specifically instructed otherwise. If you have a temporary "flipper" to wear, do not insert it until the numbness in the area is gone. When it is inserted, it should not touch the gums in the area of the surgery. If it does, this may cause ulceration of the wound edges and breakdown of the suture margins. This can lead to loss of the implant or bone graft. If you have questions about the fit of your flipper, partial or complete denture, do not wear it until your general dentist or our office can see you. Fortunately, your mouth heals quickly! We will schedule a follow-up appointment to check your healing and discuss the next steps to your procedure. Bruxism - The number one cause of dental implant failure is an untreated clenching and grinding habit. We may recommend a nightguard to protect your dental implant. Gum disease - periodontal (gum) disease can cause your dental implant to become mobile. Impeccable home care habits combined with regular dental cleanings and exams will help us keep your implant site healthy and strong. If you want to learn more about how dental benefits can benefit your health and appearance, contact our Arcadia, CA dental office to schedule an appointment with Dr. Maria Kim. We look forward to helping you meet your goals for your health and wellness. Bone grafting is a surgical procedure that uses cadaver bone in the area of an extraction to prevent soft tissue growth from moving into the socket site. This allows your body to generate bone after an extraction rather than having soft tissue fill the newly created space. This method of bone grafting is a simple way to ensure that your mouth heals predictably after an extraction and is done with minimal discomfort. Call us today for a consultation. As with all procedures, there are some risk of side effects that could occur when getting an implant. In order to make sure our patients are fully informed, we've uploaded our consent form with a full list of potential risks on our website. Click to read the implant consent form. When properly taken care of, implants can last for many decades if not a lifetime. If you'd like more information regarding dental implants or any other type of dental procedure, please contact our Arcadia, CA dentist office today. Smoking can increase your risk of implant failure significantly. The good news is that avoiding tobacco products two weeks before the start of surgery and eight weeks after can reverse some of the side effects of smoking and increase your chances at having a successful procedure. For more information on smoking and its effects on implant surgery, read our blog post. Another common questions that we get about dental implants is whether or not you can get cavities in your implant. The simple answer is no- because your implant is made of synthetic material, it cannot decay like a normal tooth and you will not get cavities on it. You still, however, need to clean and brush your gums and other teeth to maintain good oral hygiene. While you may not be able to get cavities in the implant, you can still get cavities in your surrounding teeth, and gum complications can also occur if you do not properly care for your teeth. The best way to get all of your questions about dental implants answered is to visit our office for a consultation. Our dentist will be able to evaluate your unique needs and help you determine the best treatment options for your needs! Give us a call today. If you are a smoker, you probably know first hand the affect it can have on your oral health. It harder to keep your teeth looking clean, you might notice that your mouth often feels dry, and you might even have battled gum disease at some point.